Discount will be given when all four courses are booked and paid for before commencement of the first course. We can also provide a personalised course suited to the needs of the student and employer. Contact us today for a personalised quote!! Includes reading and understanding labels and instructions of detergents, washing and hanging techniques, stain removal tips, proper ironing and minor mending techniques. Also maintaining stock levels and equipment care. Includes maintaining a high standard of personal hygiene, safety in and around the house, creating a secure working environment and keeping the house secure at all times. 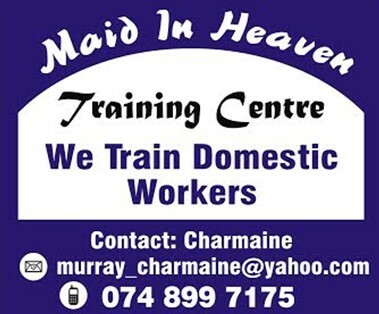 Includes disinfecting of work areas, keeping cupboards clean and organized, cleaning fridges and freezers, proper dishwashing techniques, maintaining stock levels, preparing shopping lists, equipment care, preparations of food for cooking, preparing dishes and storing leftovers, how to read and use recipes. Preparation of a recipe. Quick and easy cookbook. Saturday’s training will commence at 09:00 and refreshments will be provided. NB: Only ONE course will be presented per Saturday. A progress report will be e-mailed to the employer during each course. Workers registering for training themselves will be registered as job seekers after passing the courses. Job seeker registration will be at no additional cost.